"What would you do if on the very first day of school Dinosaur wasn't smiling his big, toothy dinosaur smile?" "You'd say, 'Don't worry, Dinosaur. School will be fun.'" Yeah, right. School-shy kids don't believe that line of persuasion for a minute, because they have a honest litany of "what if" fears about the whole experience. 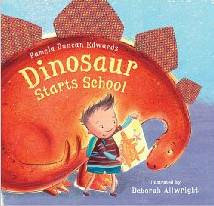 In Pamela Duncan Edwards' latest, Dinosaur Starts School, this big orange dino has his own catalog of complaints. What if he stamps his feet, And roared in his loudest dinosaur voice--ROOOOAARR! "Shy dinosaurs don't have to go to school!" You'd say, "Of course you do, Dinosaur. Otherwise, how would dinosaurs grow up to be so smart?" But this little boy's dinosaur is not persuaded. What if he gets lost? What if the noisy classroom gives him a headache? What if he CRIES in front of the whole class? What if the food in the lunchroom is YUCKY? And what if he feels all alone with all those strange kids? And to all those worries, the boy has some simple advice for his shy friend. "What if everyone ran outside to play but Dinosaur stayed behind and looked shy?" Then you and Dinosaur and your new friend would have a great time pushing each other on the swings. What if, at the end of the day, you said, 'I told you school was fun, Dinosaur. Shall we come back tomorrow?'" Notable author Edwards has shown in her earlier The Worrywarts that she knows how to banish fears with alliteration and rhyme and a touch of common sense, and her latest collaboration with artist Deborah Allwright provides some solace to soothe those first-day of school fears. And for a delightful play on the alphabet book genre, see also Pamela Duncan Edwards' Some Smug Slug, cleverly illustrated by Henry Cole, who here does some of his best work.